Tell us about it. Or not. Huh? 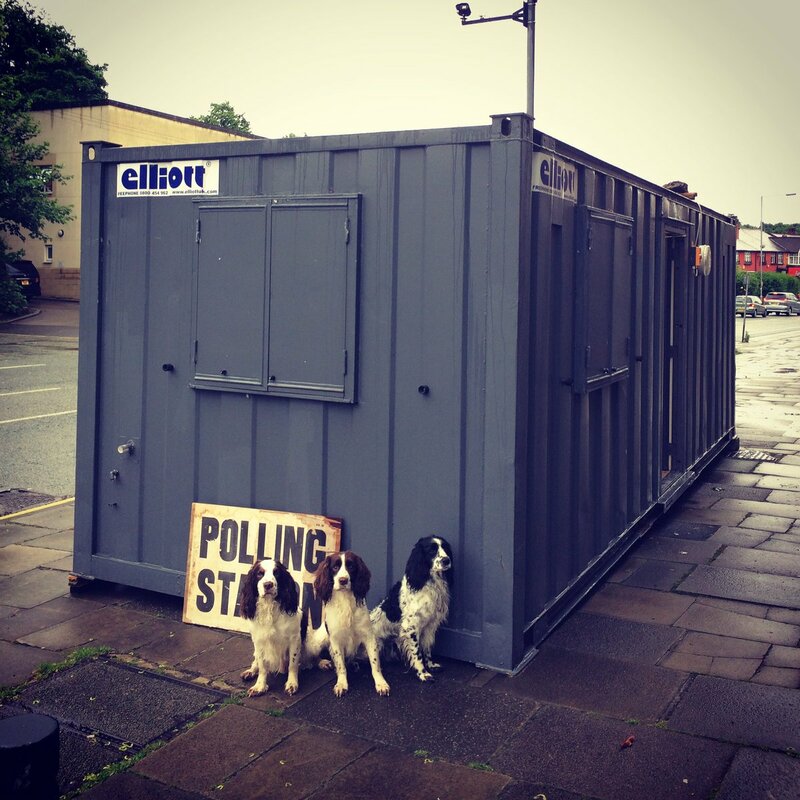 Why have we got two exit polls? Split vote leading to a hung parliament obv. Clown Ice Skater #4 wrote: Huh? Why have we got two exit polls? Because Dirk wanted to show us how much of an ist he is re: Norn Irons. Strong early showing for Labour. CJ+ wrote: Strong early showing for Labour. That's only coz they're first on the list! Strawman wrote: Split vote leading to a hung parliament obv. Prediction: hung parliament, JC reverses his "no coalition" position and gets into bed with SNP, Lib Dems, etc. Et viola, minority Labour government and another general election in six months' time. spast1kunt wrote: How have the two threads got completely different results? Dirk's exclusionary and myopic policies leading to disenfranchisement of the electorate, obv. CJ+ wrote: quote another general election in six months' time. Oh great, just what the country needs, more elections, maybe the whole 24 months of the Brexit talks can be taken up with elections, so they never actually start negotiating. 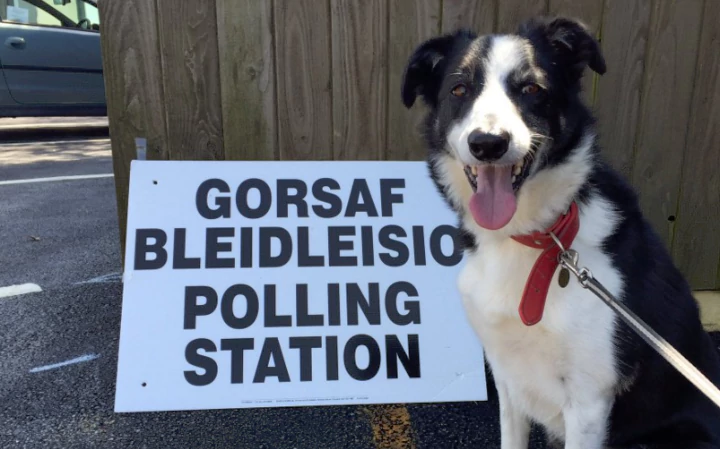 Here's a dog at a Welsh polling station. No vote for me. I rang the council to ask if my proxy had been sent yet, and found out my mother de-registered me from her address (where I was registered) after Brexit! I say "after Brexit", it was after Brexit in date, and I'm pretty certain after Brexit in sentiment. span wrote: No vote for me. I rang the council to ask if my proxy had been sent yet, and found out my mother de-registered me from her address (where I was registered) after Brexit! I'd be furious! Is she not happy she 'won'? Tsk. No Plaid Cymru or Forza Italia options. I am Quite Cross. There's only so far I can go with 'telling off' my mum (not very far at all) because boringfamilystuff, but she's very passive aggressive, and doesn't voluntarily update or amend ANYTHING, not EVER, she's pathologically opposed to it. So I'm pretty certain it was done on purpose. Hang on, how can she "remove" you? Or has she removed herself as your proxy? I'd assumed when the form comes out where you say who is at that address she said "NOT SPAN!!!"? span wrote: I am Quite Cross. Not Fuming, Furious or Sat Here In Tears? Do you buy all this about how people fought and died for your right to vote, etc, so you HAVE to vote? Further to that, surely if anyone DID fight (and die) etc (which is not admitted) then also surely they did not do so in order that we may live in some "nazi state" where I might be compelled to do something - against my very will! I mean to say, come on fighting-and-dying people, give me a break! Do we not cherish our freedoms, so very much not half we don't! Regardless of all that, I feel that we must join together to condemn span for failing to vote. It's all very well pointing the "finger" of "blame" but Emily Pankhurst, had she survived, would surely have gone to a bit more effort. She did, after all, get trodden on. Käsemeister wrote: Hang on, how can she "remove" you? Or has she removed herself as your proxy? The (lovely) woman at the council said she sent a form back where she had 'crossed me off'? Apparently in red marker pen and with such apparent fury that the pen went right through the paper. Not really, but she did cross me off. Laugh! Did you see that one where the woman was 'fumming' about somethingorother, so everyone else just took the piss out of her being 'fumming'. Oh no1 Poor span has been transported back to the halcyon days before women had the vote! Quick charleston to wipe away those tears, span? Which is why I think there should be a "None of the above" option. span wrote: Laugh! Did you see that one where the woman was 'fumming' about somethingorother, so everyone else just took the piss out of her being 'fumming'. They get so angry about such trivial stuff, write 3000 words in one giant paragraph to ask if they're BU then strop off when they get told they are.